Dr. Katherine Schier, our Kalamazoo, MI family and cosmetic dentist, is passionate about dentistry and wants to make sure her patients have the information they need to make good decisions about their oral health. Below you will find a wide array of interesting and educational links that we feel will benefit your understanding and knowledge of your dental hygiene. We’re always happy to add to this list! If you have a suggestion for a link related to cosmetic dentistry, family dentistry, or dental technology that you find interesting, please feel free to email it to us so we can share it with all of our patients. If you’re looking for further reading about cosmetic dentistry, dental procedures, or preventative dentistry, the Academy of General Dentistry and the American Dental Association are both great resources. Dr. Schier wants to make sure that her patients understand the dental technology and procedures we use in our Kalamazoo, MI dentist’s office. Here are some helpful links if you’d like to learn more about what’s happening with your teeth. 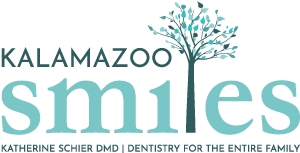 Need more information from our dentist in Kalamazoo, MI? Dr. Katherine Schier is always happy to answer your dental questions at your next dentist appointment. To request an appointment with Dr. Schier, call Kalamazoo Smiles at (269) 353-3700.